When people do business with each other, there may be a point where the two parties doing business have different wants and ideas about things, from how much they are going to get paid to everything else in between. This is where having some sort of negotiation checklist in order to make sure that the negotiation goes smoother with the other person or people that you are doing business with. Problem is, it’s hard to keep all of the negotiations and people organized. This is where having a Microsoft Word Negotiation Checklist Template comes in handy, helping you stay on track as far as where you want your negotiation to go, and the reason or reasons why. Even if you’re not in any negotiation yet, the negotiation checklist can help you think ahead to what kind of negotiations that the other person or business may have for you. 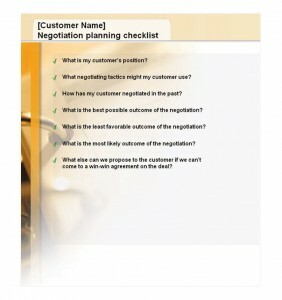 Best of all, this negotiation checklist is completely free to use! Absolutely no money is needed in order to download and use this template. First, fill in the name of the specific customer you are making a business deal with at the top of the negotiation checklist document. After that, you simply have to think about and answer all of the questions about the business deal and the person after the green checked questions. Take the time to really think about the questions that it asks you. That way, your results as far as the business meeting will be more positive for you. Print out more than one if you are having trouble keeping track of current business deals. It will keep you more organized, and free you up to think about other matters. It creates less stress for you as well. Answering the questions well may take more time, but it’s time well invested.